Engawala? Have you heard this name before? In Aboriginal language, Engawala is also known as Intiarntwa. It is a small community of about 150 people located 200 kilometres north-east of Alice Springs. The local language is Eastern Arrernte. The community is well supported with a general store, shire office, night-patrol office, aged-care facility, early-childhood centre, medical clinic, school and activity hub. Engawala is situated on Alcoota Station, one of the Northern Territory’s oldest pastoral leases, which was handed back to traditional owners in 2012. The station is also well known in scientific circles for the unique fossil beds located on the property. Young men within the community are frequently called upon to assist with managing cattle and other pastoral activities. In Engawala My Pathways is also active. My Pathways is a national company, regionally based. Its staff understand the challenges facing people living in rural, remote and regional Australia. The company provides an innovative and simple service solution, offering job seekers everything they need with a range of support programs, education, training, labour hire, apprenticeships, traineeships, community support and networks. My appointment as Finke River Mission support pastor for the Alyawarr and Eastern Arrernte language region means that I am coming to the community quite regularly. Every time I approach Engawala I drive through a conspicuous hill formation. The locals call these two equally high hills ‘The Twins’. On the right, the driver can see a simple steel cross, although you have to look closely to see it. It’s a different story if you are travelling past this place in the evening. The cross is illuminated by solar energy. Under a clear night sky, it flashes with small and large stars, and immediately attracts attention. It is set up in such a way that from a distance one has the impression that the cross is hovering over the hill or lowered from the sky. It’s a special sight that invites silence, reflection and prayer. A local told me that the people of Engawala had heard about the million-dollar illuminated-cross project at Haasts Bluff. There it is planned to build a 20-metre cross on top of Memory Mountain. The residents of Engawala thought, what the mob in Haasts Bluff can do, we can do that, too. So they were eager to build a big illuminated cross, maybe even more attractive than the one at Haasts Bluff. My Pathways’ employees approached their leader and enthusiastically presented their idea about the cross. But the leader first of all calmed them down and then suggested, ‘You do not need such a giant cross. A small and modest one will do just as well, and we would also have the right materials for it. I could help you with that’. So, with their leader, the Pathways crew went to work, creating and installing the cross you see in the photos. It stands whether the sun burns down or a sandstorm blows through the steppe country. 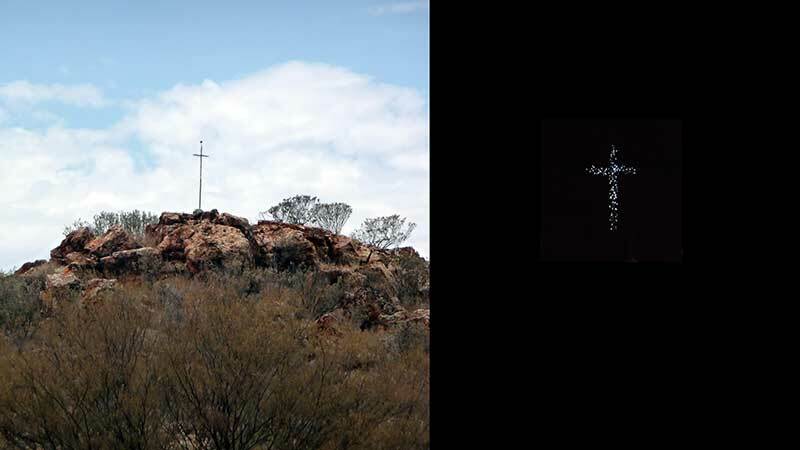 At night the cross of Engawala shines far into the country and reminds everyone that One watches over us and is light for us when it gets dark in our lives. When we look up to him, Jesus Christ, then light will be switched on in our hearts, no matter how dark it has become around us. An Aboriginal man who came to believe in Jesus Christ relatively late in his life says: ‘I guess in the inside I was searching for love. I was bleeding on the inside like nothing else. I wanted that, I wanted to hear it from my dad. I never heard it. Somebody invited me to church one day, so I went along. That day was meant for me. It was “divine appointment”. The man was preaching that somebody loved me – my heart was popping — that he died on the cross. I had never heard that before. I gave my heart to Jesus that day, and a light switched on in my life’.